I’ve been procrastinating. Last Friday, the bed didn’t get made until 3:30, lunch wasn’t eaten until 4, and that doctor’s appointment I was going to schedule…that didn’t happen at all. Mr. R and I have been back from vacation for almost a week now, and I haven’t written anything new here despite jotting down some ideas before leaving town. My blog’s first birthday went by, and I failed to bake it a cake. Even my last post was a procrastination tactic of sorts. Those cookies were baked, photographed, and eaten in Madison months ago. Resolved to remediate the situation, I sat down and started writing about coffee; but the words paled in comparison to the beautiful baby quilts materializing in my sewing room. My premise was thin, disjointed, and scattered. I had no recipe, no inspiration, and no story. There was nothing to do but procrastinate some more. To alleviate the nagging guilt, I took that tricky, round-a-bout approach to procrastinating where one task is shunned in favor of another that’s had its own share of putting-off: I got myself a snack and sat down to learn how to use Mr. R’s fancy camera. 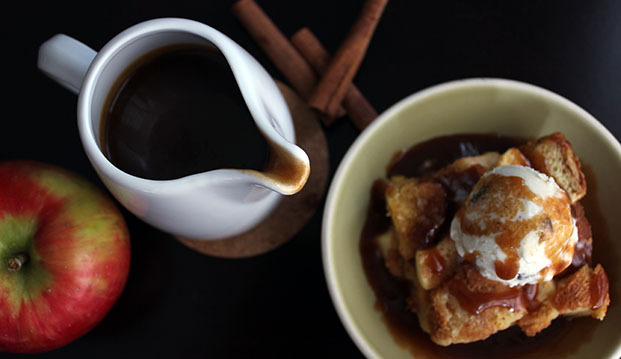 With the goal of learning f-stops, ISO’s, and shutter speeds, a cinnamon scented brioche and apple bread pudding emerged from my oven and caramel sauce bubbled on the stove. Unintentionally and unexpectedly, inspiration came back candidly and instinctively as I focused my attention on another task. Starting out, I had no intention to post this recipe to the blog. Truthfully, I don’t care for bread and for bread pudding even less. But when I finally tired of fiddling with camera settings, I tried a fork-full; and when I finished it standing by the kitchen counter, I knew I had to share. This bread pudding involved a bag of stale brioche crusts from my freezer, two apples from the fridge, and some stale fall-flavored doughnuts because I saw them at the store while grabbing the cream and why not? Feel free to use another enriched bread (like Challah) in place of the brioche and to change the ratio of doughnut to bread. 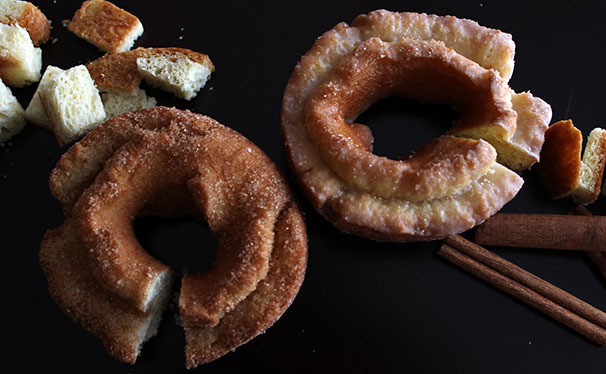 Just keep in mind that bread = fluffy and light but doughnut = dense and heavy. Strike a balance. I had to test to make sure the doughnuts were stale. QC. The mix of crisp apple, cakey doughnut, and fluffy brioche gives this dessert the textural interest I often find lacking in bread pudding. Freshly grated cinnamon gives off a sweet, wonderfully comforting aroma. 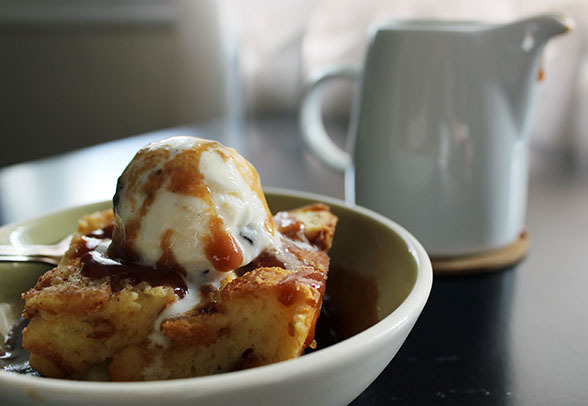 Topped with rich, apple-scented caramel sauce and creamy vanilla ice cream slowly melting from the residual heat, this is the best thing I did all day! Mr. R knows I generally don’t condone procrastination, but sometimes giving myself the freedom to stop festering over a project and to let go of all my preconceived ideas, agendas, and goals gives my head the space it needs to do what comes naturally. 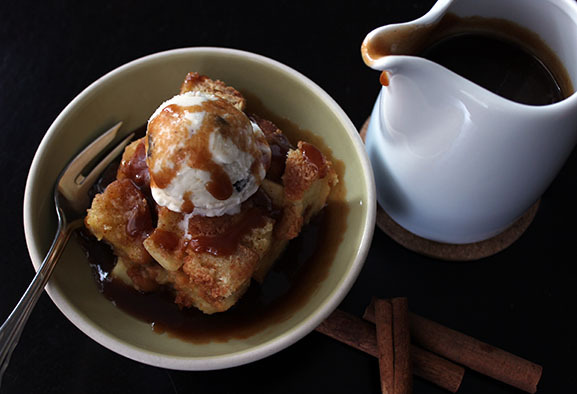 If you are waxing for a fall dessert but are already bored with apple pies, this bread pudding will suit the mood. Its homey and simple appearance is deceiving. Perfectly paired with vanilla ice cream and caramel sauce, it makes a dessert worth skimping on dinner for. I highly recommend (beg you) to eat this still warm from the oven. If needed, it can be gently reheated but will be drier and less luxurious as a result. Peel, core, and cut the apples into chunks. 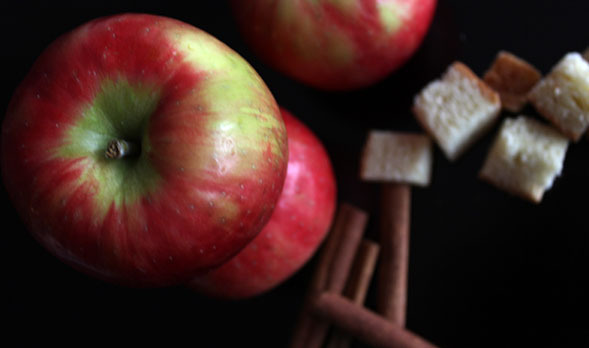 Toss the apples in a bowl with 2 Tbsp brown sugar, 1 Tbsp white sugar, salt and freshly grated cinnamon (whole cinnamon sticks can be grated on a microplane. 1/4-1/2 tsp ground cinnamon can be used instead). Put the apples in a colander over a bowl and let stand for about an hour, shaking occasionally to help the juices drain. Preheat the oven to 350° and lightly grease an 8″ square baking pan. Place the brioche and doughnut into a bowl and toss together. Add the apple, reserving the drained juice for the caramel sauce. In a pan over medium heat, bring the milk and cream to a bare simmer. While the milk is heating, whisk together the eggs, sugar, and salt in a large bowl. Once the milk is steaming and a ring of tiny bubbles is forming at the edges of the pan, turn off the heat. Slowly pour about 1/3 of the hot milk in a thin stream into the eggs while constantly whisking to avoid cooking the eggs. Whisk in the remaining milk and 1 tsp vanilla. Pour the warm custard over the bread and apples. Toss everything to coat but do not let the bread sit in the custard too long or the pudding may end up mushy. Pour off the excess custard. Press the bread into the baking pan. Don’t smash it down too much, but do make sure everything is nicely packed together and even on top. Pour the extra custard over the pudding until it comes just shy of the top of the bread (you may have some custard leftover and that’s okay). Grate (or sprinkle) cinnamon to taste on top then bake for 25-30 minutes until the custard is set and the top has browned. Remove and let cool. Be careful when cooking sugar. Sugar boils hotter than water and is very sticky. If you get it on your skin, it is hard to remove quickly and will result in a painful burn. While the pudding is baking, prepare the caramel. Add 1/2 cup liquid from the drained apples (plus water if needed) to a small pan over medium heat. Pour 1 Cup sugar into the water and use a spatula to evenly distribute it in the pan. Without stirring or agitating, let the mixture come to a boil. Boil until the sugar is melted and has turned the golden color of honey (about 20 minutes, no stirring please!). You can check the color by dipping a clean spoon into the sugar and dripping it onto a white plate. Once the color is obtained, turn off the heat. Standing back from the pan, pour in 1/3 of the cream. The mixture will boil and steam. Whisk together then add the remaining cream in two additions. Turn the heat back on and bring the caramel to a simmer for 2-3 minutes. Turn the heat off and stir in the salt and vanilla paste (or sub vanilla extract). 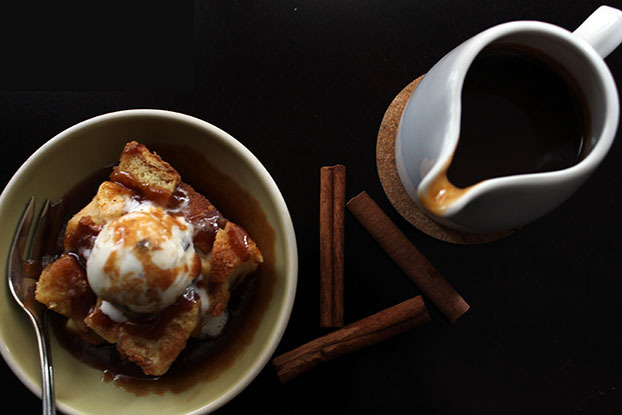 Scoop a big spoonful of warm bread pudding into a bowl, top with vanilla ice cream, and drizzle liberally with caramel sauce. Find your slippers and enjoy! One Response to "Title To Be Determined…"